2000 Johnford SV-40 CNC Vertical Machining Center s/n MD0061 w/ Fanuc Series 18-M Controls, 24-Station ATC, CAT-40 Taper Spindle, 8000 Max RPM, 20” x 48” Table, Coolant. Kitamura Mycenter-1 CNC Vertical Machining Center s/n 02785 w/ Fanuc Series 0-M Controls, 20-Station ATC, BT-35 Taper Spindle, 12,000 Max RPM, Daikin Oil Coolant, 14” x 31” Table, Coolant. 1990 Fanuc Tape Drill Mate-MODEL T CNC Drilling and Tapping Center s/n P906MB907 w/ Fanuc Series 0-M Controls, 10-Station Turret ATC, BT-30 Taper Spindles, 15” x 26” Table, Coolant. 2006 Trak DPM3 3-Axis CNC Vertical Mill s/n 062CE14437 w/ Proto Trak SMX Controls, 3000 Max Dial Change RPM, 40-Taper Spindle, 3Hp Motor, Chrome Box Ways, Power Drawbar, 10” x 50” Table, Tool Mist. 2011 Trak DPM2 3-Axis CNC Vertical Mill s/n 114DK64113 w/ Proto Trak SMX Controls, 40-5000 Programmable RPM, R8 Spindle, Chrome Dovetail Ways, Power Drawbar, 9” x 49” Table, Tool Mist. 2000 Trak SPORT BC 3-Axis CNC Vertical Mill s/n 003BG10333 w/ Proto Trak M3 Controls, 70-4200 Dial Change RPM, 40-Taper Spindle, Power Drawbar, Chrome Box Ways, 10” x 50” Table, Coolant. 1995 Trak TRM 3-Axis CNC Vertical Mill s/n 95-584 w/ Proto Trak MX2 Controls, 70-4200 Dial Change RPM, 40-Taper Spindle, Power Drawbar, Chrome Box Ways, 10” x 50” Table, Coolnt. Trak / Bridgeport 2-Axis CNC Vertical Mill s/n 113283 w/ Proto Trak SM Controls, 3Hp Motor, Speed-Rite Dial RPM, R8 Spindle, Power Drawbar, Chrome Dovetail Ways, 9” x 42” Table. 1997 Sharp mdl. 1118H Tool Room Lathe s/n CTL-1164 w/ Sony DRO, 130-3000 RPM, Inch/mm Threading, Tailstock, 5C Collet Closer, Power Feed, 6” 3-Jaw Chuck, Coolant. ELB mdl. SPA2030 20” x 30” Automatic Hydraulic Surface Grinder s/n 89257 w/ ELB Controls, Spark-Out Control, Wheel Dresser, 20” x 28” Electromagnetic Chuck, Coolant and Filtration System. (4)MHT Mitsui High Tec mdl. MSG-200MH 6” x 12” Surface Grinders s/n’s 92037701, 91077542, 90117392, 89087020 w/ Sony DRO, Wheel Dresser. Deckel SO Single Lip Tool Grinder s/n 79-19407 w/Collets. Brown & Sharp MicroVal CMM Machine s/n 0196-1037 w/ Renishaw TP-ES Probe Head, QC-5000 Software. ROI Ran Optical Instrumentation OMIS-2 4” x 8” Optical Video Probe s/n 4866-91-228 w/ QC-5000 Software, Computer, Dual Monitors. Mitutoyo Tool Makers Microscope w/ 2-Axis DRO, Light Source. Leica Stereo Microscope w/ Light Source. Imia Seiki Rockwell Hardness Tester s/n 3976. Starrett Digi-Chek 12” Height Master. Mitutoyo 24” Dial Height Gage. (5)Starrett 24” x 36” x 6” Crystal Pink Granite Surface Plates w/ Cabinet Bases. Microflat 24” x 36” x 6” 2-Ledge Granite Surface Plate w/ Roller Base. DoAll 18” x 24” x 5” 2-Ledge Granite Surface Plate. Big Joe mdl. 1518-A6 1500 Lb Cap Electric Pallet Mover s/n 87086. 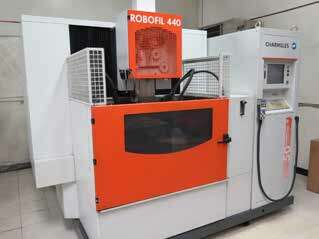 2003 Charmilles Robofil 440 CNC Wire EDM Machine s/n 930386 w/ Charmilles Controls, Hand Held Controller, Filtration System. 2006 Charmilles Robofil 240CC CNC Wire EDM Machine s/n 921480 w/Charmilles Controls, Filtration System. 1995 Charmilles Robofil 2020-1 CNC Wire EDM Machine s/n 123408 w/Charmilles Controls, Hand Held Controller, +-30 Deg Draft Angle, Filtration System. 1998 Charmilles HD8 High Speed EDM Super Drilling Machine s/n D9071518 w/ Charmilles Controls, Heidenhain DRO. LeBlond Makino EDNC32-A8 CNC Die Sinker EDM Machine s/n DB1-971 w/ MGC Controls, Makino Teach Pendant, 9” Quill Travel, 13 3⁄4” x 19 3⁄4” Table. 2006 Advantage M1-2A-CH Process Chiller s/n 98371. Advantage mdl. SC-2AY-21HFX Temperature Controller s/n 27136.